At the height of the Cold War, the Soviet Union – determined to win the Space Race at any cost – green lit a dangerously advanced mission. They sent three cosmonauts farther than anyone has gone before or since. 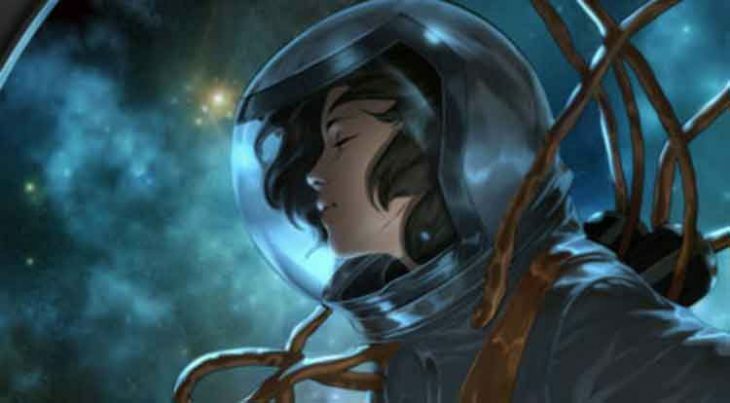 Handpicked orphans with no connections to Earth, trained as devout Communists, and restricted from having families, they became lost in the stars and encountered something Unknown… Something that changed them. Long thought lost and erased from the history books, Abram Adams was the first to return. The few that have been able to reach him believe him to be a deity. They say he can bend matter, space, and even time to his will. But, even with limitless powers, he is concerned only with the secret love he hid away from his superiors and the unborn child he never met. 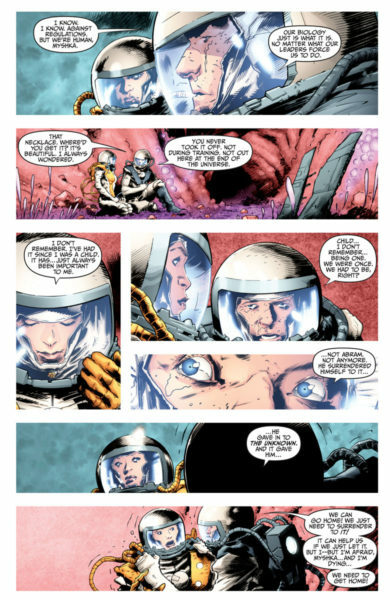 In the first DIVINITY, Abram Adams, a Russian cosmonaut, reaches the end of the known universe and is basically imbued with powers that establish him as a sort of benevolent god who can control space and time. 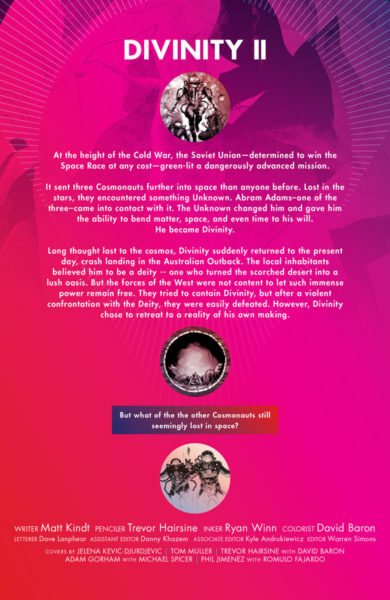 In the end, love for his family (that he wasn’t supposed to have) outweighed his love of Mother Russia, and he abandoned the other two cosmonauts and returns to Earth where he ultimately enters a self-imposed isolation after a brief run in with Unity. 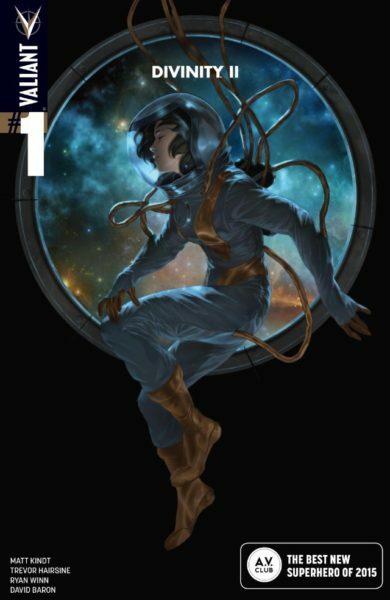 DIVINITY II #1 provides an interesting antithesis to that story. Unlike Adams, Mishka puts nothing above the Soviet Union. She sees Adams abandonment as treason against the USSR. In her return to Earth she discovers that the Soviet Union has fallen, and decides to use her considerable powers to help restore the Motherland to its former glory. 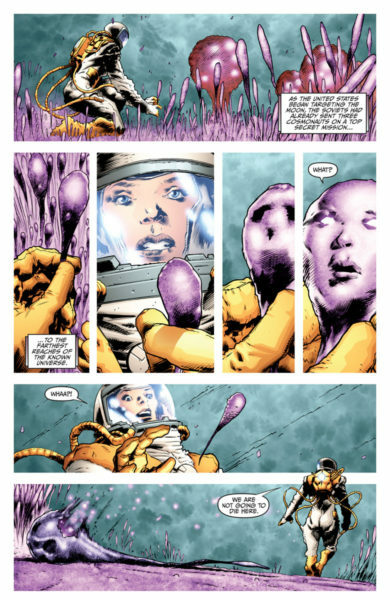 I’m not going to lie… I had a hard time understanding the first DIVINITY. I think if I had read it all at one time, it probably would’ve made more sense to me. 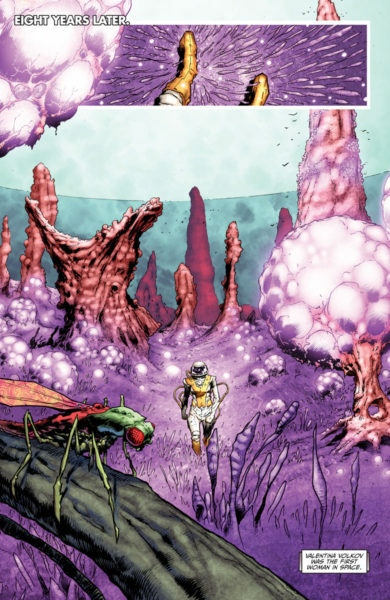 Matt Kindt is a brilliant writer and is simply much, MUCH smarter than me – and that’s okay. With that being said, DIVINITY II made more sense to me in the context of the first one. The world had already been built. Instead of trying to comprehend the mind-bending journey that lead to Abram Adams extraordinary powers, I am asked to understand absolute loyalty to one’s ideals and the feeling of betrayal. This book was really good. The DIVINITY books have always been on the trippier side, and this one is no exception, as you will see from the previews below. 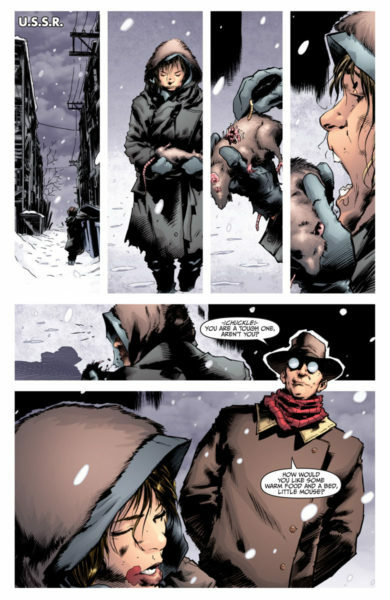 The art team, consisting of Trevor Hairsine, Ryan Winn, and David Baron, pulls off some insane panels and makes it look easy, while Matt Kindt, as always, writes a strong, character driven story. It will definitely be interesting to see where this series goes. I love the idea that Adams is this benevolent deity that just wants to keep to himself, while Mishka wants to help Putin rebuild the USSR. Her belief that Abrams is a traitor also sets up an interesting confrontation between two incredibly powerful Russian-cosmonauts-turned-deities. 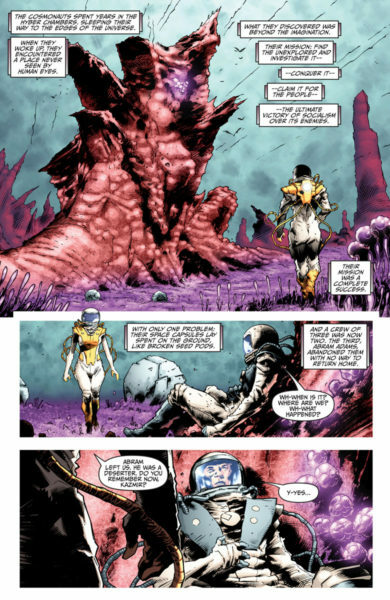 One thing is for sure, Valiant is putting together the best shared universe in comics, and the introduction of DIVINITY II adds another element to the mix.